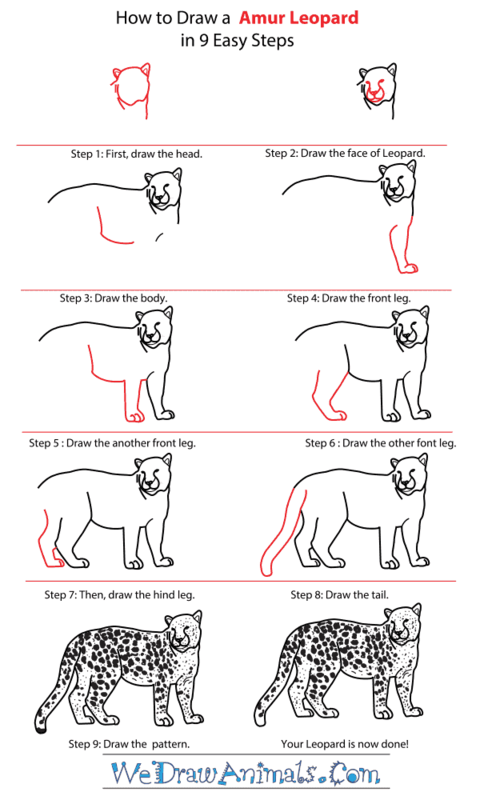 In this quick tutorial you'll learn how to draw an Amur Leopard in 9 easy steps - great for kids and novice artists. 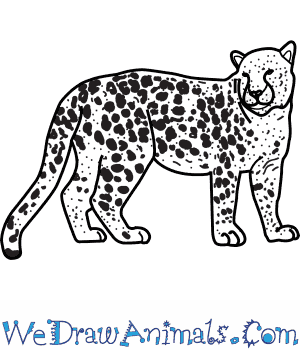 At the bottom you can read some interesting facts about the Amur Leopard. 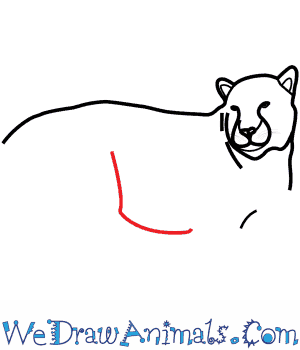 Step 1: The first step in drawing the Amur Leopard is to draw its head. To create the head, draw a circle with two triangle on the top for ears and straight lines coming from the bottom of the head for his neck. 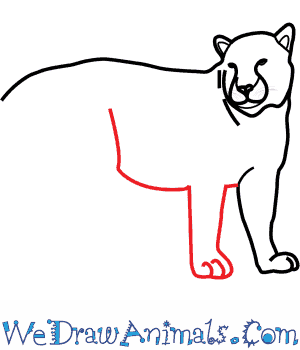 Step 2: Next you will need to draw the Leopard's face. Draw two circles for the eyes and an oval for the nose. Then use straight and curved lines to create the mouth and shape of the nose. Step 3: Now you will need to draw the body. 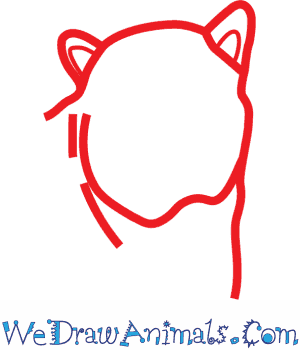 Start by drawing a curved line coming from the top of the neck out to create the back. Draw an angled line in the lower part of the body for the abdomen and another straight line coming from the bottom of the head for the neck. Step 4: The next step is to draw the front leg. 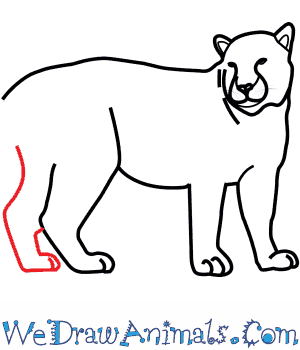 Use two parallel lines to create the leg and a curved one to create the paw. Add two curved lines to create the shape of the toes. Step 5: Now draw the other front leg the same as the first one. Step 6: Next you will need to draw the hind leg. 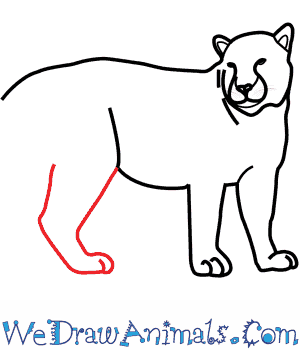 To draw the hind leg, use two angled lines to form the top and bottom of the leg and form the paw the same way as the front one. Step 7: Then draw the other hind leg the same as the first coming out behind it. 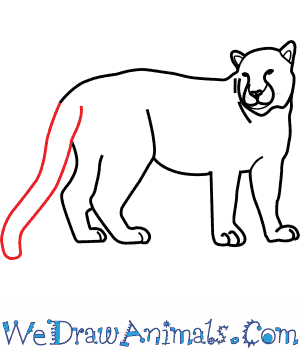 Step 8: The next step is to draw the tail. To create the tail, draw two parallel lines that come together at the bottom. Step 9: For the final step, you will want to add the body pattern. Create the body pattern above using both small, medium, and large dots. 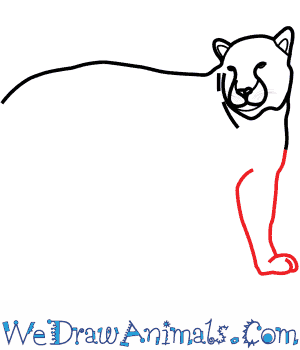 You have now drawn an Amur Leopard. Amur Leopards are actually a subspecies of leopard. 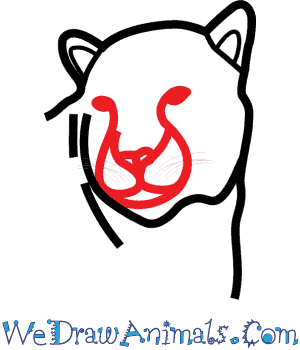 Which means it’s a leopard that has a different color of fur and lives in a different place. All leopards have spots though. Amur Leopards can be found in the Southeast Russia and the Jiln Province in China. 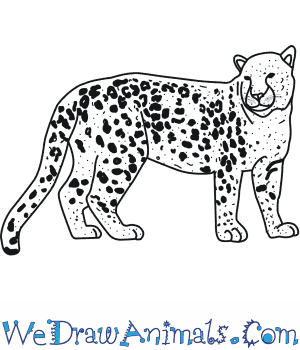 These leopards eat all kinds of deer, moose, wild pigs, hares, badgers, all kinds of birds, and mice. A male will measure between 42 and 54 inches long. Amur Leopards are “critically endangered” and have been since 1996. They were hunted for their fur and now have to fight with the changes going on around them. Leopards and Tigers often fight over territory; big cats are very protective of their homes. An Amur Leopard has to deal with Tigers coming in and eating all the food. People are trying to help by avoiding destroying the Amur Leopards’ habitat. Today most of the leopards live in zoos. Amur Leopards are the only leopards who live in a snowy climate. They will eat a Eurasian Black Bear cub if it is less than two years old. Known for a cream colored coat of fur, but they can have fur that ranges from light yellow to a yellow-red color. A litter of cubs is 1-4. Cubs leave their mother at the age of 1 ? or 2 years. Activity: Want to play a fun variation of capture the flag? Divide into two teams and decide who will lead team “Tiger” and team “Leopard.” Instead of flags use something like a box of rice or a bag of oranges.